A VaultCollectibles exclusive! Authentic dilithium crystals actually used in the filming of a Star Trek episode. The prop card is in mint condition and will be shipped with the utmost care and comes in protective case as shown. 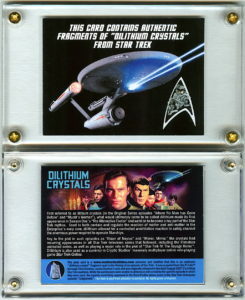 Card reverse features a brief history of dilithium crystals in the Star Trek universe. Please note- the “crystal” fragments were actually used in the filming of Star Trek. Placement and amount of crystals on the card may vary slightly from image shown but the card you receive is essentially the same. Rittenhouse’s Star Trek Beyond Cards, Better Late Than Never?